So that’s that, on a miserable night for Manchester United. 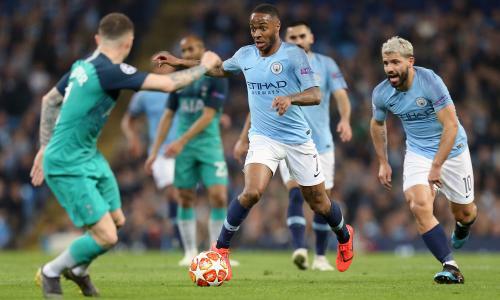 Their participation in this season’s Champions League is hanging by a thread after PSG turned up the heat during the second half. Our man Daniel Taylor was at Old Trafford to witness it all, and here’s his verdict. Thanks for reading! A grim-faced Solskjaer trudges off as PSG cavort in front of a bouncing away end. Their support was magnificent tonight, as impressive as their team. Some perspective will surely be in order. PSG were third favourites to win the Champions League this morning, and bossed this match accordingly. United gave it a good go in the first half but couldn’t absorb the blow of losing so much pace in Lingard and Martial. 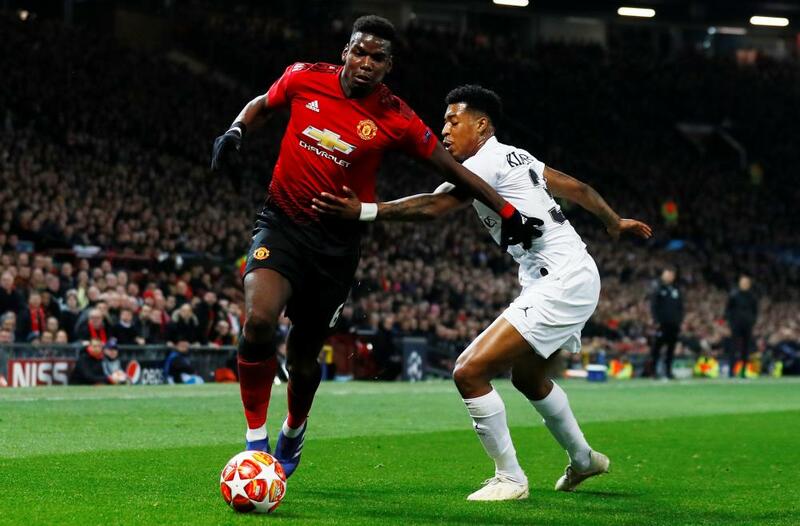 United - whose home form in Europe is becoming something of a problem - will have to do something special at the Parc des Princes next month if they’re to turn this around. 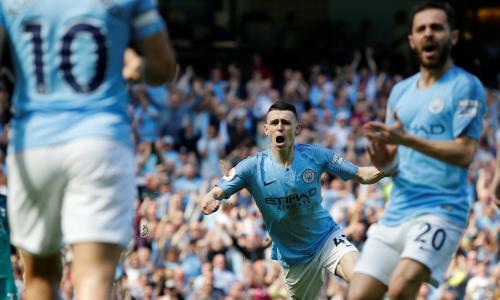 But never say never: they’ve already won a big away game this season, at Juventus, while Solskjaer has been known to inspire the odd European comeback in the past. 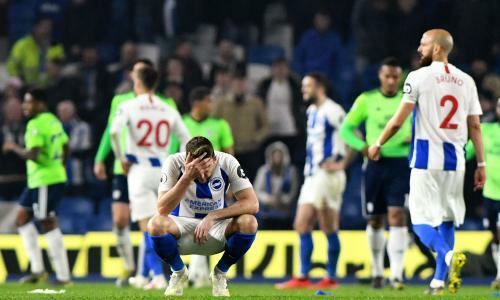 A dreadful night for United comes to a close. 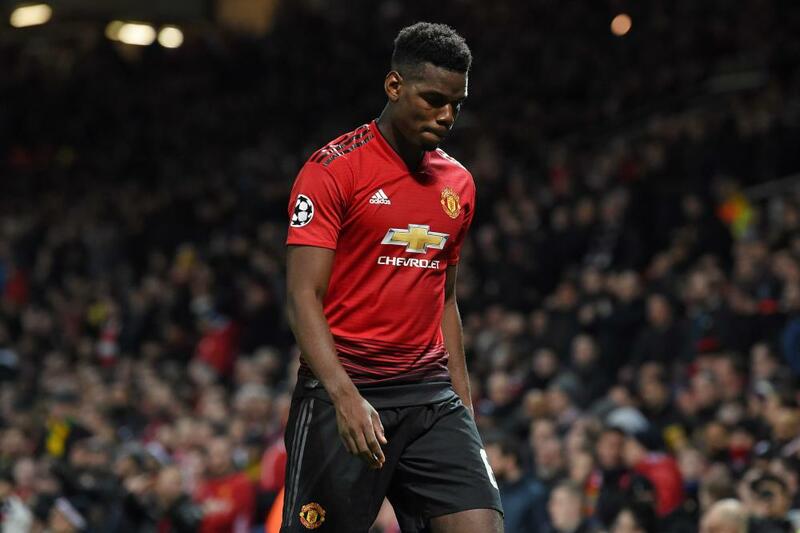 They’ve lost Anthony Martial and Jesse Lingard to injury, while Paul Pogba stupidly got himself sent off and will miss the second leg in three weeks time. PSG have two away goals in their pocket, and one foot in the second round. United have it all to do. It’ll be fascinating to see how Ole Gunnar Solskjaer responds to the first serious setback of his interim reign. 90 min +3: It’s a game of keepball now for PSG, and their fans are enjoying it very much. It’s ole football; just not the Ole football the home faithful were hoping to witness. 90 min +1: Now it’s Shaw’s turn to go into the book, for clanking into the back of Dani Alves. 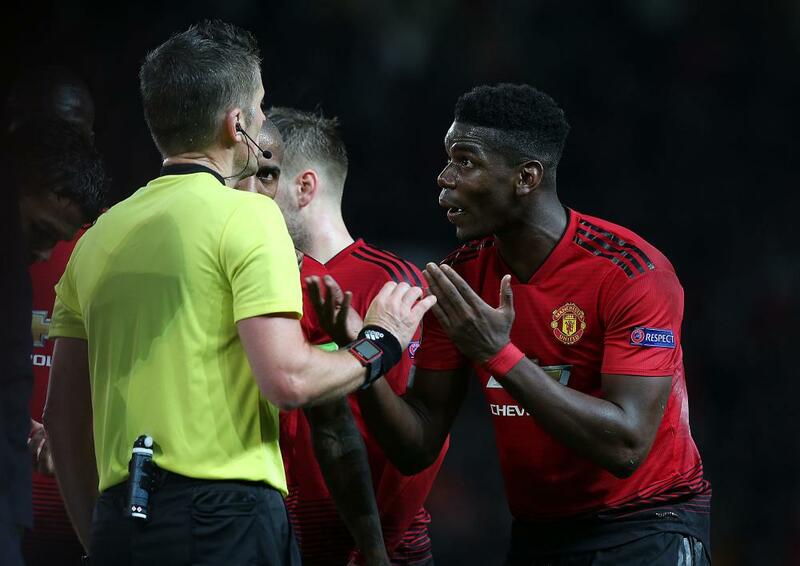 There have been ten yellow cards this evening, with six shown to United players, two of them to Pogba alone. He’ll be a huge miss in Paris for the second leg. 89 min: Yes, it’s a second yellow. For a while, it looked as though the United captain Young has talked himself into trouble, and been shown a second card. But after some confusion, it’s Pogba that’s been sent packing, and he can have no complaints. That wasn’t a good tackle on Dani Alves at all. He departs down the tunnel, a frustrated figure. 88 min: Dani Alves blooters a witless free kick straight into the United wall. That allows Pogba to have a wander down the left. Upon losing control, he crumps his studs into Dani Alves’s leg. That’s a poor challenge. A second yellow coming up? 87 min: Mbappe spins and turns on the jets. As he approaches the United box he’s nicked to the floor by Herrera, who becomes the latest player to go in the referee’s very thick notebook. 86 min: Shaw and Mata work their way down the left. The ball’s dinked forward in the hope of sending Sanchez scuttling off into space, but the flag goes up for offside. The home fans are getting a little frustrated with Sanchez, a smattering of groans here and there. 84 min: United have got PSG pinned back in their box. But they can’t fashion space for a shot, or find the killer through-ball. Herrera tries to wedge Rashford clear, but the ball harmlessly bounces out for a goal kick. And then Rashford is replaced by Lukaku, United’s final throw of the dice tonight. 82 min: Herrera has been his usual relentless self. He makes a little space to the left of the D, and looks to snap a curler into the top right. It’s wide and high, but not so far away. A decent effort out of very little. 81 min: Di Maria, who has two assists to his name tonight, despite getting the bird all evening, is replaced by right-back Champions League debutant Colin Dagba. Di Maria takes his sweet time to depart, and ostentatiously claps the away support before he sits down. 80 min: United enjoy their best period of possession of the night. But they go nowhere, with PSG happy to sit back in their final third and keep their shape. 78 min: United knock the ball this way and that. Then Herrera slips Young free with a cute pass down the right. Young whips a low ball down the corridor of uncertainty ... but nobody in red has taken a chance, and four white-shirted defenders can usher the ball away from danger. A sorry end to a nice passage of play from United. 76 min: A ball-on-string dribble by Mata down the inside-right channel. He flicks a pass wide to Young, but the resulting cross is easily cleared by Thiago Silva. United come again, but Mata’s shot from distance is a poor effort. 75 min: Verratti is down getting treatment, having turned his left ankle. The physio applies some magic spray, but it doesn’t work, and he’s limping off in some pain. Paredes, the £47m signing from Zenit, comes on in his stead. 73 min: Rashford looks the best bet if United are to get something out of this. Young sprays a lovely ball down the right, the lively striker nearly getting clear. But Bernat does just enough to close him down. 71 min: But that’s allowed United to up the pressure for the first time in this second half. Herrera has a whack from distance and the ball pinballs out for a corner. However Shaw’s delivery is appalling and the visitors are able to clear. 69 min: A lull, which will suit PSG down to the ground. Matic tries to get something going from a deep position on the left, sending a glorious crossfield ball towards Rashford. But the striker can’t control, and it’s a throw to PSG deep in their own territory. 67 min: Herrera, out on the right, crosses long for Shaw, who brings it down and shoots from the left-hand corner of the box. Dani Alves charges it down; danger over. 65 min: Now Draxler sends Bernat into acres down the left. His rising screamer is tipped over the bar by de Gea, who has just single-handedly kept his team in this. The resulting corner comes to nothing. United need to clear their heads, and quick. 63 min: United are in serious danger of losing this round-of-16 tonight. They’ve overcommitted, and when Herrera’s cross is intercepted, Mbappe is sent screaming down the right. He’s clear into the box, draws de Gea, and looks to dink over the keeper and into the net. De Gea sticks up an arm, while starjumping in the Schmeichel style, and that’s a crucial - and brilliant - save. 62 min: Dani Alves comes through the back of Pogba, who springs up in a furious mood. 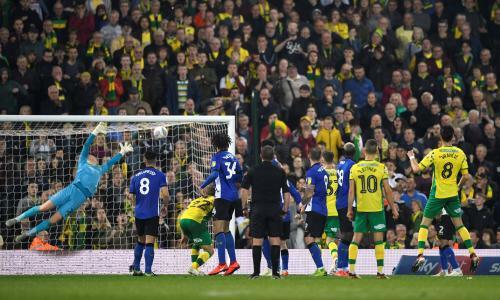 The referee flashes yellow; the resulting free kick is easily cleared by the visitors. PSG glide up the other end, and take control of this tie. Kehrer slips Di Maria away down the left. 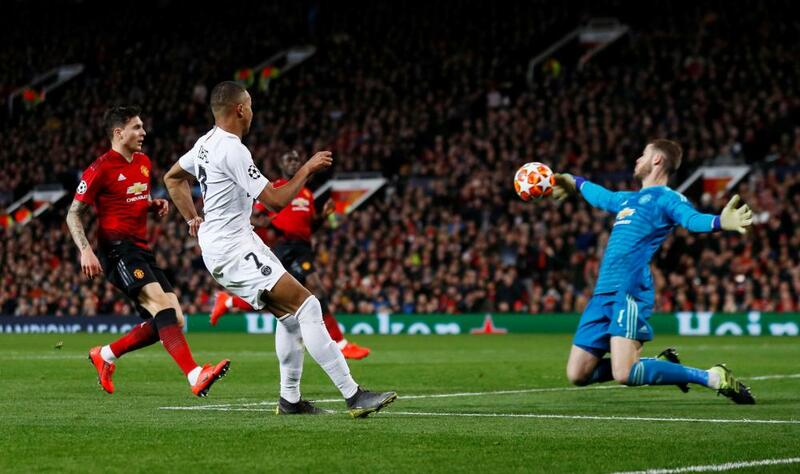 Di Maria’s low cross is perfection, allowing Mbappe to open his body up and meet it with a dainty sidefoot six yards out, flicking the ball past de Gea and into the bottom right. That was such a clinical break; what a cross and finish. 59 min: But this is better from United. Mata swings one in from the right. It’s only half cleared and drops to Herrera, whose first-time smash goalwards bounces through a crowded box and millimetres wide of the bottom left! Buffon looked as though he knew that was going wide, but dear me he was taking some risk there. That was ludicrously close to the goal United desperately need. 58 min: United are struggling to put anything together in attack. They’ve been second to pretty much everything since the restart. 56 min: Draxler’s corner is half-cleared by Rashford. The ball drops to Dani Alves on the edge of the box. The resulting volley comes off the ankle of Pogba, and nearly flies into the left-hand side of the net past a wrong-footed de Gea. Fortunately for United, the ball flies inches wide of the left-hand post, and the second corner leads to absolutely nowt. But that was so close to a terribly unlucky break for the hosts, who are rocking a bit here. 55 min: PSG have been in control of this match since the restart. Marquinhos sends Di Maria away down the left; he wins a corner off Young. Di Maria prepares to take, and someone eejit launches a bottle towards him. Draxler will take instead. Di Maria takes from the right, looping the ball to the far post. United are standing as statues, and Kimpembe races in to sidefoot a volley past de Gea from close range! That’s as easy a goal as you’ll see; United were collectively asleep there. And now the French champions have a precious away goal. 52 min: Di Maria drives at the United back line, then lays off to Draxler, who then feeds Dani Alves on the right. The resulting cross is a waste of time. But PSG get the ball back and hog it awhile. 50 min: Lindelof is the latest player to go in the book, for a tug on Mbappe. That’s three apiece now. 49 min: Young pearls a pass down the right for Rashford, who makes off into space before being stopped by Thiago Silva. Rashford one-twos with Mata, then whips a cross through the box to nobody. 47 min: Lindelof barges into the back of Mbappe. No foul. Then Rashford appears to be hauled back by the already-booked Kimpembe. No foul for that one either! This referee was card happy in the first half; it appears he’s taking a more laissez-faire approach for the second. And we’re off again! Manchester United get the second half underway. They’ll be kicking towards the Stretford End, having made their second enforced change of the evening during the break: Martial isn’t able to continue either, and he’s replaced by Mata. 45 min +4: It looks as though Lingard can’t continue. He’s down holding his left hamstring. Sanchez had prepared to come on for Martial a few minutes ago, but now he’s taking Lingard’s place instead. 45 min +2: Dani Alves scoops a harmless free kick over the bar, de Gea behind it all the way. 45 min: United easily clear the corner and stream upfield. Verratti crunches into Martial, who looks revived, to put a stop to the break. PSG counter the counter, and Matic brings down Draxler just to the left of the D; a free kick. In between times, Lingard goes over and requires some treatment. There follows a couple of minutes of downtime, before we get round to the free kick. The two minutes of added time will effectively start now, announces the ref. 44 min: Di Maria and Bernat combine well down the left, turning Bailly and Young this way and that. 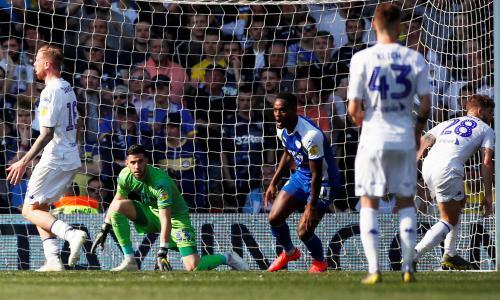 Lingard is forced to track back and concede a corner. 42 min: Young wins a corner down the right. It comes to nothing. Di Maria comes back on the field of play to a chorus of boos. This has been high-octane fun, if not particularly full of quality play. 40 min: It all kicks off as Mbappe slips a pass out to the left for Di Maria to chase. It’s not a good pass, and Di Maria’s never getting to it before it goes out of play. But Di Maria and Young are going at full pent. Young needlessly shoulder barges Di Maria off the pitch and into the wall surrounding the pitch. Ooyah, oof. Everyone gets involved in a heated discussion, but the referee does nothing. 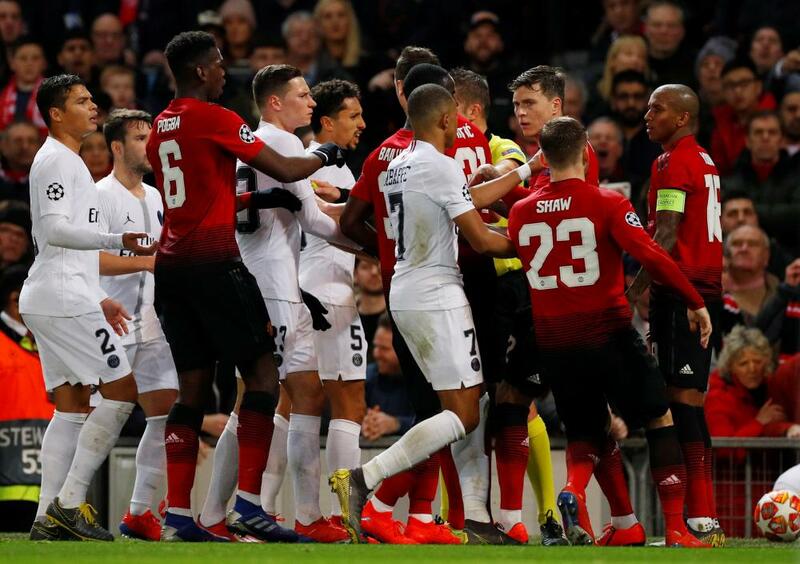 Young is perhaps fortunate to escape a second yellow - that’s certainly what the PSG players wanted to see - while Di Maria remains off the pitch having his arm looked at, the result of that awkward fall. 39 min: Martial is down feeling his hamstring. Not sure whether he’ll be able to continue. Sanchez, warming up on the touchline, is summoned back to the bench. 37 min: A lull. Then suddenly PSG spring to life! Verratti slips a ball down the middle to split United’s defence in two. Mbappe and Di Maria are both clear! Mbappe defers to Di Maria, which isn’t the right decision as he’s offside, whereas the striker isn’t. Di Maria tries to round de Gea on the outside, and manages it, but then fails to sidefoot into the open net, inexplicably allowing de Gea to gather. The home crowd enjoy his failure very much indeed. Di Maria is very pleased to see the flag go up, so his miss didn’t matter, but PSG made a right balls of that. 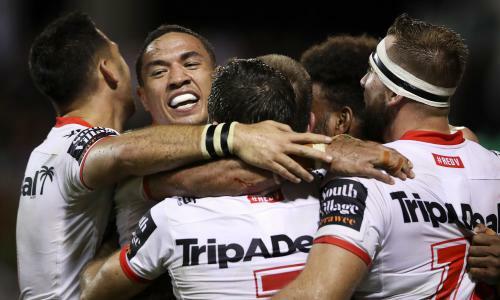 34 min: Yes, there’s a good chance this won’t end with 22 men on the field. Now it’s Bernat who goes into the referee’s notebook, punishment for running with great feeling into Young as the two challenge for a 50-50 down the United right. Five bookings already! 32 min: Pogba slides across the wet turf and nearly clatters into Thiago Silva. Then seconds later, Shaw clatters into Kimpembe as he tries to round him out on the left. The ref sees neither challenge as a foul, which is probably correct and also just as well, seeing both Pogba and Kimpembe have already been booked. They need to wind it back in a bit. 31 min: Di Maria curls it into the mixer. Lindelof heads clear. But the Parisian fans continue to make the most of the noise, as their team begin to take a semblance of control (though there’s not much in it). 30 min: Mbappe chases after a long pass down the left, and is hauled back unceremoniously by Young. That’s a clear booking and a free kick for PSG out by the touchline. They load the box in preparation. 28 min: Mbappe had been quiet, but suddenly he’s come to life. Verratti, quarterbacking from deep, slips a pass down the inside-right channel that’s immediately helped on by Draxler. Suddenly Mbappe is free in the area! But he’s never in control and hoicks a shot wide right while falling back, de Gea having got right up in his grille. A suggestion Mbappe might have been an inch or so offside; it’d have been a poser for the dude in the VAR truck had it gone in. 27 min: Mbappe turns on the jets and nearly gets past Lindelof. 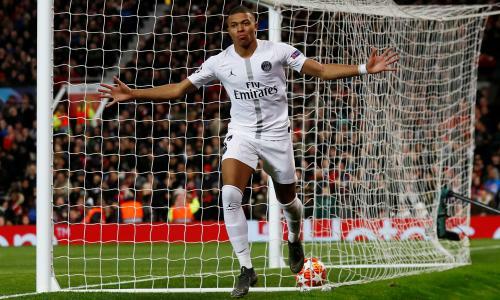 The United defender just about kept on his tail, doing enough to force Mbappe into a heavy touch that puts a stop to his gallop. But for a second there, United look exposed by Mbappe’s pace. 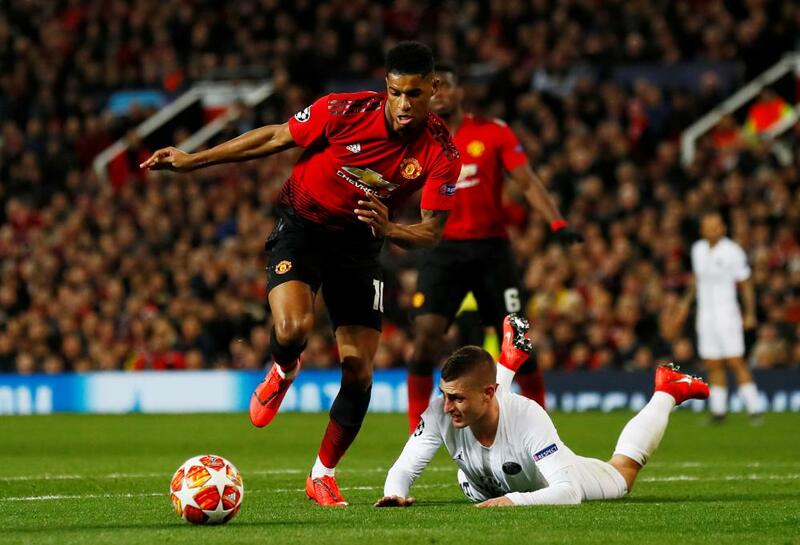 25 min: More nerves, as Verratti dribbles back towards his own area and is nearly stripped by Rashford. The ref blows for a free kick, getting Verratti off the hook. Then the same player is kicked from behind by Pogba, and you know what this referee thinks of that. Yellow card. A fair chance already that this won’t end 11 versus 11, not that it’s a particularly dirty game. 24 min: Lingard one-twos with Rashford down the right and suddenly he’s racing into a PSG half that contains only one defender! He’s got Martial on the other wing, but just as the crowd get excited, he plays a dreadful pass behind Martial and out of play on the left. Both sides are looking a little shaky right now. 22 min: Pogba sticks his glove over the mouth of Marquinhos as the pair tussle in midfield. It’s a free kick, and the United midfielder is a wee bit lucky that the ref doesn’t flash a card in his grid. He was probably helped by Marquinhos going down in theatrical style. 21 min: The 4,000 PSG fans are giving it plenty. Their heroes ping it around awhile, their first period of sustained possession. Verratti then tries to release Mbappe down the inside-left channel, but the pass is way too strong and flies out for a goal kick. On the touchline, Thomas Tuchel throws semaphore shapes in a grand fit of anger with his own players. 19 min: Now Draxler is booked for a clip on the heels of Herrera. It wasn’t the worst challenge you’ll ever see, but this ref is taking no nonsense. 18 min: Young continues to be a nuisance out on the right. He sends in a lovely cross that nearly finds Lingard, but the ball is eyebrowed away from the United striker, six yards out, by Kimpembe. That’s such a crucial clearance. The ball goes out for a throw on the left; from that, Pogba blazes wildly over from distance. 16 min: Pogba swans past Kimpembe out on the United right and reaches the byline. He fires a low ball towards Lingard at the near post. Buffon does extremely well to get down and snaffle under extreme pressure. Thiago Silva goes over in a tussle with Lingard and isn’t particularly happy about it, but the ref simply tells him to get on with it. 15 min: It’s gone a little scrappy. Young charges down Kimpembe, who makes a meal of clearing from the left-back position. But the ball breaks through to Buffon. 13 min: A couple of slinky runs down the middle of the park by Marquinhos and Verratti. It’s a long time before they’re challenged by Matic, something United will need to address sooner rather than later. PSG look confident whenever they make their way forward. 11 min: Rashford’s quick feet in the centre of the park forces Kimpembe into dragging him back. That’s the first booking of the tie, and one of PSG’s central defenders treading on eggshells already. 10 min: PSG pass it around the back awhile. Then Buffon blooters a simple pass towards Bernat into the stand out to his left. Many ironic cheers greet this. 6 min: The first serious effort on goal of the evening, and it’s by Di Maria, who looks to curl one into the top right from 25 yards out on the left. It’s always bending wide, but it’s not certain that de Gea would have got his fingertips to it had it been bending the other way and into the top corner. 5 min: Rashford is surrounded in the centre circle and suddenly there are four white shirts running at the United back line. But a loose pass allows United to counter, Rashford trying to free Lingard into the area from the right. Not quite. But this is a lovely open, exciting, end-to-end start to the match. 3 min: Angel Di Maria, erstwhile United record signing, goes on a wander down the left. The roof nearly comes off as he’s given the bird by his old fans. He didn’t have a great time at Old Trafford, did he. 2 min: Bernat dribbles down the left but is easily robbed by Matic, who sets Lingard away on a run into PSG territory. Lingard is barged in the back by Marquinhos, who is fortunate to escape a booking for his cynicism. The resulting free kick comes to nothing. And we’re off! Amid proper bedlam, PSG get the party started. And they’re quickly pressed back, United coming quick and hard out of the blocks, Lingard and Young nearly stripping Kimpembe of possession near the right-hand corner flag. They press a bit too hard, and a free kick releases the pressure, but what an early statement of intent by United! RIP Emiliano and Gordon. 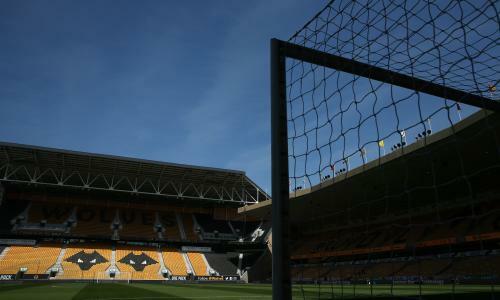 Before we kick off, there’s a minute’s applause for the tragic Emiliano Sala, and England’s 1966 World Cup winning goalkeeper Gordon Banks, who passed away today. The teams are out! 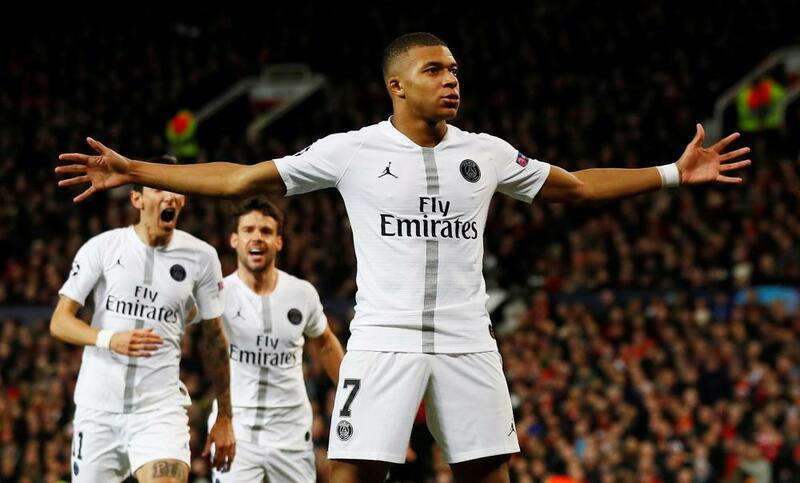 Manchester United wear their famous red shirts with black trim, while PSG sport second-choice white. There’s a proper European atmosphere at Old Trafford, as you’d expect when two of the biggest clubs in Europe prepare to get it on for a place in the quarter-finals of the Champions League. 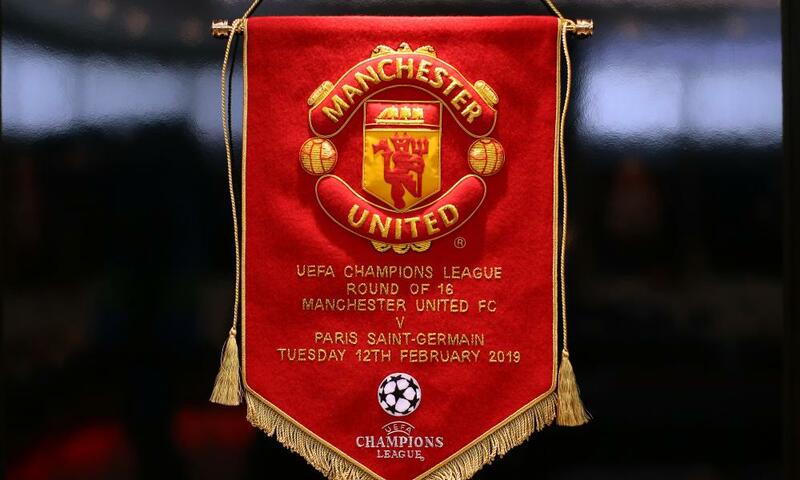 It doesn’t look as though Thiago Silva has dragged the tassels of his pennant through that gunk, while in other gift-related news, our picture editor has confirmed that it is indeed another arguably unnecessary ® stitched underneath Uefa’s logo on the United flag. So apologies for casting any aspersions on the quality of the embroidery. Anyway, we’ll be off in a minute! VAR will be used for the first time in the Champions League tonight. The whole kit and caboodle is set up in the back of a Transit van in the Old Trafford car park, which will send a cold shiver down the spine of anyone who sat through ITV early-evening light-entertainment show The Premiership back in the day. Uefa refereeing bigwig Hugh Dallas is interviewed in the truck by BT Sport, brandishing a leaflet which explains using words and pretty pictures that the VAR team will “constantly check for clear and obvious errors related to the following four match-changing situations: goals, incidents in the penalty area, red cards, and mistaken identity.” So there you have it. Incidentally, the feed cut out and the screen went to black exactly 16.3 seconds into the interview. Hopefully that’s not a harbinger of things to come. 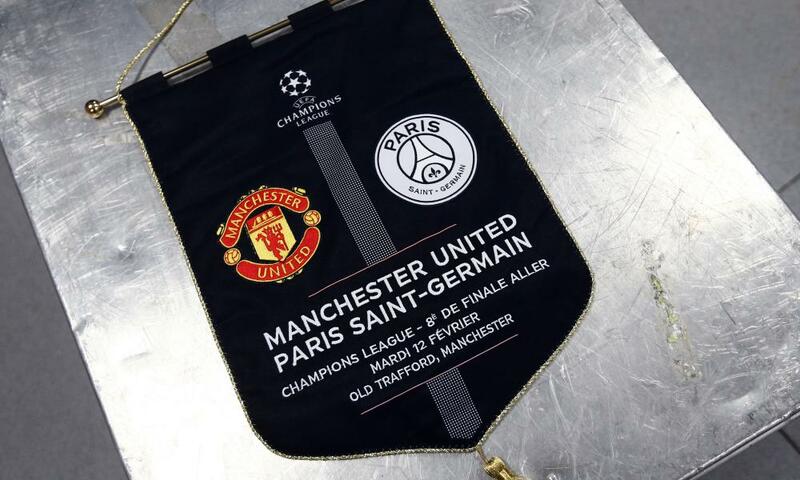 PSG’s pennant isn’t quite as sumptuous. A crisper, clearer design perhaps, but without the grandeur of United’s effort. Let’s hope the tassels don’t get dragged through that sticky patch to the right. Ole Gunnar Solskjaer makes five changes to the Manchester United team named at Fulham on Saturday. In come Ashley Young, Eric Bailly, Victor Lindelof, Jesse Lingard and Marcus Rashford; they replace Diogo Dalot, Phil Jones, Chris Smalling, Juan Mata and Romelu Lukaku. Thomas Tuchel makes six changes to the PSG XI selected for the scrap against Bordeaux in Ligue 1 at the weekend. Edinson Cavani and Thomas Meunier picked up injuries; they’re replaced by Thilo Kehrer and Kylian Mbappe. Meanwhile Stanley N’Soki, Eric Maxim Choupo-Moting, Christopher Nkunku and Moussa Diaby make way for Marquinhos, Angel Di Maria, Juan Bernat and Julian Draxler. Manchester United: de Gea, Young, Bailly, Lindelof, Shaw, Herrera, Matic, Pogba, Lingard, Martial, Rashford. Subs: Romero, Jones, Sanchez, Mata, Lukaku, Fred, Dalot. The world was a different place back on December 17. Jose Mourinho was still manager of Manchester United, for another 24 hours anyway, and when the draw for the Champions League Round of 16 was made, it looked all over for the three-time winners. They’d been paired with Paris St Germain, going great guns while United were misfiring badly. A humbling looked a very real possibility. But a couple of months on, everything has changed. 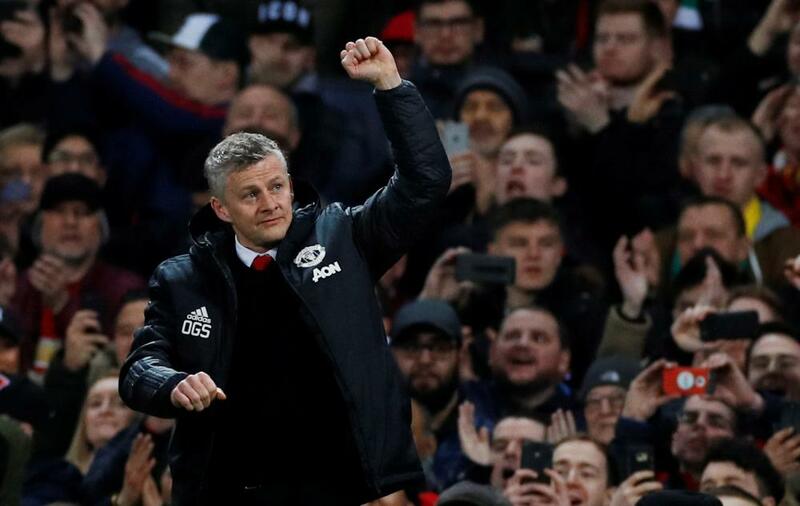 Ole Gunnar Solsjkær has restored United’s self-belief in spectacular style, winning 11 of his first 12 games as interim boss. Paul Pogba and Anthony Martial are purring. PSG meanwhile are in the midst of an injury crisis. Edinson Cavani isn’t expected to shake off a hip problem, Thomas Meunier is concussed, and Neymar is out with a broken metatarsal. 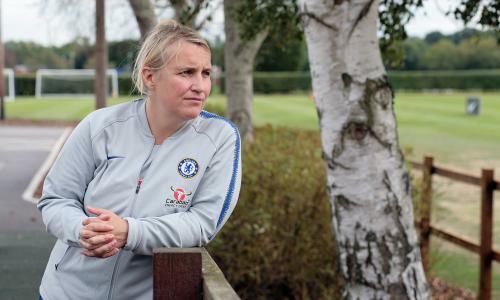 And their form suddenly isn’t all that: they’ve recently lost their first league game of the season, to Lyon, and required extra time to get past third-tier Villefranche-Beaujolais in the cup. 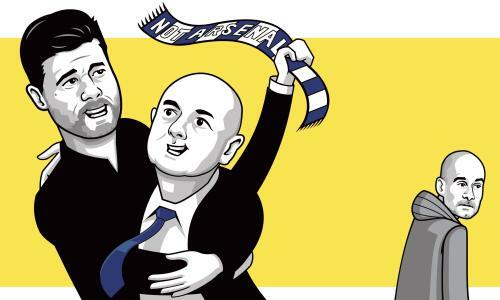 United will raise a glass to all that; they’re now favourites to seize the initiative in this tie tonight. Still, they won’t be counting chickens. They’ve only won once at Old Trafford in Europe this season, scraping 1-0 past Young Boys, drawing 0-0 with Valencia and losing 1-0 to Juventus. And they were beaten at home at this stage last year by Sevilla. They’ll be hoping the all-new Ole football brings that sticky run to an end. But PSG have their own worries, having tumbled out at this stage in the last two seasons, thrashed by Real Madrid last year, humiliated by Barcelona’s greatest-ever comeback in 2017. With their squad stretched, plenty rests on young Kylian Mbappe’s shoulders tonight. So here we go, then, the business end of the Champions League. It’s deliciously poised, with traditional giants hosting one of the tournament favourites. It’s another big European night at Old Trafford. It’s on!